Justin Verlander found his groove on the mound, and the Detroit Tigers rediscovered their stroke at the plate. Verlander (14-5) shut down the New York Yankees on three hits over seven innings while Detroit roughed up Mike Mussina and a couple of relievers to rout the suddenly struggling Yankees, 16-0, last night in Detroit. It was the most one-sided road shutout loss in Yankees history, topping a 15-0 defeat at the Chicago White Sox on July 15, 1907, according to the Elias Sports Bureau. The Tigers took three of the four and won a series for the first time since sweeping Minnesota July 17-19. They won back-to-back games for just the third time since having baseball's best record on July 21. Detroit didn't make up any ground in the AL Central, though, because the Cleveland Indians won their third straight game to maintain a 2 1/2-game lead. New York has lost five of seven games and fallen eight games behind AL East-leading Boston. The Yankees, who had closed within four games of the Red Sox when the trip started, host Boston in a three-game set starting tonight. "There's no time to lick your wounds," manager Joe Torre said. "You've got to go on and play and start putting the wins up again, and we're capable of doing it." Mussina (8-10) might've pitched himself out of the rotation, lasting just three innings and giving up six runs, nine hits, and a walk. He has allowed 19 earned runs in 9 2/3 innings -- an ERA of 17.69 -- in his last three starts. "I can't believe in three starts that I forgot how to pitch after 17 years," he said. "So I just hope he has confidence enough in me to keep sending me out there and let me figure this out." Torre wasn't making any promises. "Right now, he's still in line for his next start, but we'll see," Torre said. "I'm not prepared to answer those questions -- not after this game." 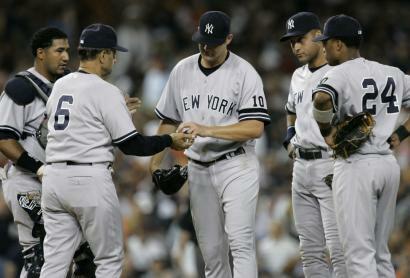 The Yankees yanked Mussina after three innings, then Edwar Ramirez and Sean Henn didn't fare any better. Angels 6, Mariners 0 -- John Lackey pitched his second straight seven-hit shutout against the Mariners, and visiting Los Angeles beat Seattle to increase its lead in the AL West to three games. Garret Anderson homered and had three RBIs as the Angels improved to 9-4 against Seattle this season. Lackey (16-8) joined Boston's Josh Beckett and Tim Wakefield as the major leagues' only 16-game winners. Seattle remained two games ahead of the Yankees in the wild-card standings. Padres 3, Diamondbacks 1 -- Geoff Blum hit a two-run homer in the seventh and Jake Peavy was brilliant again with 11 strikeouts, helping host San Diego trim Arizona's lead in the NL West to two games. Peavy (15-5) tied his career high in wins as the Padres retained a three-game lead in the wild-card race over Philadelphia. Phillies 9, Mets 2 -- Chase Utley had three hits, including a solo homer, in his first game since having hand surgery one month ago, and host Philadelphia beat New York in the opener of a pivotal four-game series. J.D. Durbin had a career-high six strikeouts in 6 1/3 innings, helping the Phillies move within five games of the Mets. Indians 8, Twins 3 -- Paul Byrd beat Minnesota for the fourth time this season, Victor Martinez homered, and host Cleveland turned a triple play while ending the Twins' season-high five-game winning streak. The Indians turned their first triple play since 1992 -- and first in Cleveland since tripling up the Twins in 1976. With runners at first and second, Mike Redmond to hit a hard grounder to third baseman Casey Blake, who stepped on the bag and threw to second baseman Asdrubal Cabrera, whose relay to first baseman Martinez easily beat the slow-footed Twins catcher. White Sox 5, Devil Rays 4 -- Jose Contreras (7-16) got his first win as a starter in two months and A.J. Pierzynski, Jermaine Dye, Juan Uribe, and rookie Josh Fields homered in a five-run seventh inning to lead Chicago past visiting Tampa Bay. Dodgers 5, Nationals 4 -- Derek Lowe (11-11) won despite giving up three homers, including a two-run shot to Wily Mo Peña, and Ramon Martinez hit a go-ahead sacrifice fly as host Los Angeles handed Washington its fourth straight loss. Blue Jays 6, A's 2 -- Troy Glaus's run-scoring double off the wall highlighted Toronto's four-run rally in the 12th inning as host Oakland lost its fourth straight. Oakland tied it in the eighth on Dan Johnson's RBI single, and the A's bullpen retired 11 straight batters before Vernon Wells and Frank Thomas singled to lead off the 12th, setting the stage for Glaus. Giants 4, Rockies 1 -- Rich Aurilia singled home the go-ahead run in the eighth inning for the second straight day as host San Francisco Giants its fifth straight. Braves 13, Marlins 2 -- Brian McCann hit his second grand slam in a week and visiting Atlanta beat Florida.